Ms. Mariam Noland is the founding and long-time president of the Community Foundation for Southeast Michigan. She built the organization from its founding to $780 million (in 2015) assets for the southeast Michigan metropolitan region, which includes the City of Detroit. A part of her extraordinary leadership has been in working with other community foundations across Michigan to build community-based philanthropy. Ms. Noland was a leader in strategy setting for all of the community foundation related ventures over the past 30 years, and as a member and former chair of CMF’s board, a leading contributor to the development of the philanthropic community in the state. Ms. Mariam Noland talks about her career in philanthropy. Ms. Mariam Noland talks about the launch of the Michigan Community Foundations' Youth Project (MCFYP). Ms. Mariam Noland talks about the development of national community foundation standards. Ms. Mariam Noland talks about how CMF helped develop the Exxon Energy Initiative. Ms. Mariam Noland talks about how people in Michigan set the bar high for quality leadership. Ms. Mariam Noland talks about the importance of the Michigan Community Foundation Tax Credit to Michigan residents. Ms. Mariam Noland talks about how the leaders of the Council of Michigan Foundations (CMF) would be willing to work at the grassroots level. Ms. Mariam Noland talks about the Branding Project creating the slogan, "For Good, For Ever." Ms. Mariam Noland talks about how CMF brought philanthropic actors together in order to create a national framework. Ms. Mariam Noland talks about the impact the Michigan Community Foundations' Youth Project (MCFYP) can have on a young person's life. Ms. Mariam Noland obtained her Ed.M. from Harvard University and a Bachelor of Science from Case Western Reserve University. After working for a number of years in the education field as well as at the St. Paul Foundation, Ms. Noland began her work within the Michigan philanthropic sector. In 1985, Ms. Noland became the first president of the newly-formed Community Foundation for Southeast Michigan, where she still serves as president today. 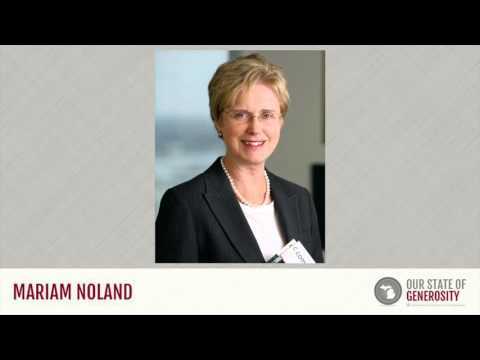 Ms. Noland has grown the organization from its founding to over $780 million (in 2015). The Community Foundation for Southeast Michigan serves a diverse, seven-county region with a population of over four million people. Ms. Noland served in several critical roles within the Council of Michigan Foundations (CMF), including board chair and member of several key committees. During her time on the board at CMF, Ms. Noland assisted in launching the Community Foundations Energy Initiative, which helped distribute some of Michigan’s portion of the Exxon Oil fine payout in 1987. CMF worked with the State of Michigan to create a challenge grant, in which private funds, totaling $3.8 million, leveraged an additional $3 million public dollars. The state funds were then granted out by community foundations to nonprofits in order to increase energy efficiency and savings, while the private funds formed endowments that continue to fund environmental and energy initiatives. Additionally, CMF was given $364,000 to distribute to those areas not covered by a community foundation. This project was the first private/public partnership between the state government and CMF. In addition to the Energy Initiative, Ms. Noland was a critical voice in the beginning of the Michigan Community Foundations’ Youth Project (MCFYP), as CMF and supporting community foundations built the program’s framework. After recognizing the need for Youth Advisory Councils (YAC) as an integral part of the challenge grant offered through MCFYP, Ms. Noland and the Community Foundations for Southeast Michigan piloted one of the first YAC. Ms. Noland continued to lend her experience in MCFYP as it transferred into the Michigan Community Foundations’ Venture Project. She also was instrumental in negotiating the joint venture among the community foundations to adopt a common computer program for each of Michigan’s community foundations. In 1995 Ms. Noland strongly advocated for and supported a statewide “branding and marketing” initiative for Michigan community foundations, which was later named the Venture Products Fund. Ms. Noland continues to serve as president of the Community Foundation of Southeast Michigan. She has served on the boards of the Council of Michigan Foundations and the national Council on Foundations. She is has served as a member of the board of trustees of the John S. and James L. Knight Foundation, Independent Sector, and was a vice chair of the board of the Henry Ford Health System. Mariam Noland was interviewed regarding her insights and experiences working with Michigan’s philanthropic community and the Our State of Generosity (OSoG) partners. The following are selected quotations from her interview specifically related to the five organizing themes of the OSoG project.